Family farming is seeing a change in direction. In recent generations, grown children have been returning to the farm with less frequency. The ‘urbanization’ phenomenon has left large numbers of consumers without a strong connection to agriculture. This is a concern for many producers, especially in the cattle production industry where animal welfare has become an area of heavy scrutiny. The lack of connection with agriculture leaves many consumers in a position where they are vulnerable to the alternative views and opinions of animal rearing. Some images and stories have created a false narrative and reflect poorly on the industry. A number of producers and agricultural organizations have responded by giving consumers a first-hand look at how livestock are actually handled, focusing on the care and precautions made to ensure that livestock are being raised in the best possible conditions. While numerous industries are affected by activist groups, one such example of activist group resistance involves sheep producers voicing the dangers of leaving sheep un-sheared (Geisel, 2018). Figure 1. Proper livestock handling technique. Images of cattle being physically beaten, being pushed into tight quarters by abrasive and loud individuals and being generally mistreated are disturbing for everyone – including producers. While these handling techniques most likely exist, they are not commonplace. The great majority of producers would not let an individual practicing these methods anywhere near their cattle. Not only is this treatment of animals ethically inappropriate but the resulting emotional and physical harm brought about by these handling procedures decrease the profits a producer stands to gain (Grandin, 2017). Canadian cattle producers take pride in proper handling techniques and provide the highest animal welfare possible. Proper handling techniques are those that reduce animal stress while increasing overall animal health. In accordance to the Canadian Criminal Code, any persons found willfully mistreating or neglecting an animal can be held responsible to the full extent of the law (Animal Care, 2013). Additionally, the beef sector is also regulated by the Code and Practice for the Handling of Beef Cattle (Animal Care, 2013). Proper handling techniques result in a safer environment for both the animal and the producer. Proper handling practices in regard to cattle, as well as most livestock, include staying calm and not making unexpected movements. When working properly with animals the handler should establish the animal’s trust. This can be done through the use of a consistent tone and a steady pace. These steps ensure that the handler can enter the animal’s field of sight with minimal risk of inducing fear or causing them to retreat. “With eyes positioned on the side of the head, cattle have panoramic vision of three hundred and thirty degrees and binocular vision of twenty-five to fifty degrees,” (Phillips, 1993). This is particularly important when working with cattle, as their wide field of vision allows them to pick up unintended movements of individuals present. 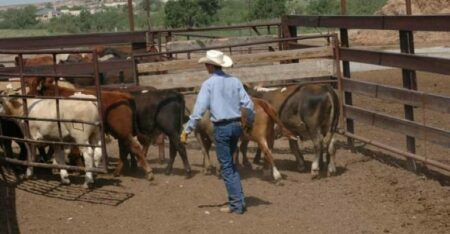 “When animals become accustomed to a calm handler and learn to trust the handler they will have less of a tendency to look at the handler,” (Grandin, 2017), this allows the handler to safely and efficiently work the cattle. Figure 2. Layout of standard S shaped corral system and chute. Proper handling will use only minimal amounts of pressure to move the animals, removing such pressure when the desired outcome has been reached. One thing that producers consider while operating livestock systems is how their handling practices can reduce animal stress. One major recommendation regarding livestock is the use of a solid sided chute designed to imitate the shape of an S. These chutes are not only common in standard operations, but they are also very common in slaughter houses. “Curved working facilities prevent the animal from seeing the head gate or squeeze until they are almost upon it, reducing stress during processing” (Boyles, 2005). 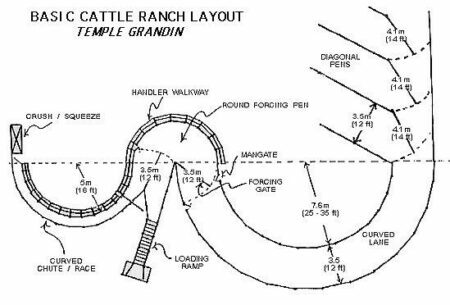 In addition to reducing stress at the entrance of the chute, these systems will prevent sudden movements from entering the animals field of view allowing the cattle to move forward with minimal stress levels. Figure 3. Low stress cattle handling. 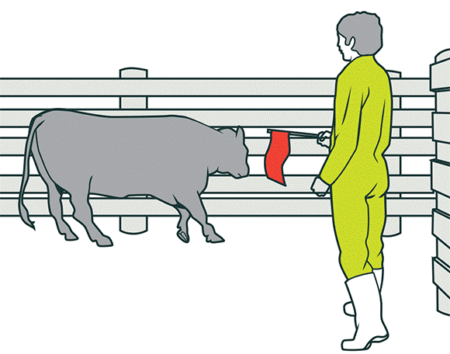 Common practices among producers often display proper handling techniques and low stress chute systems. Producers aim to ensure that the animals they raise are getting the highest level of care and safety as well as to ensure that all workers maintain a safe environment. However, consumers who have lost their connection to the more ‘hands on’ areas of agriculture can be mislead to believe otherwise. Programs that allow consumers a first-hand look at the practices involved in raising and growing food aim to educate consumers. The practical purpose of this type of consumer education is to combat the fear propaganda surrounding agricultural practices as well as misguided animal welfare concerns. These alternative views should be of great concern to the cattle industry as it impacts consumer demand. The livestock industry’s consumers are constantly being exposed to fear-based concerns and unscientific facts, rather than proven scientific facts. Despite the diminishing connection that consumers have to the farm, the use of their purchasing power should stem from a proper understanding of animal welfare and agricultural practices. The development of this understanding is necessary to utilize consumer purchasing power to the fullest extent while holding producers to a fair and knowledgeable standard. Phillips, C.J.C (1993) Cattle Behaviour. Farming Press Books, Wharfdale Rd, Ipswich, U.K.
Hi, my name is Chayce Gavelin and I am in the second year of an Agronomy degree with an Agribusiness minor. I grew up in southern Saskatchewan near the small town of Meyronne, where my family runs a mixed farming operation. 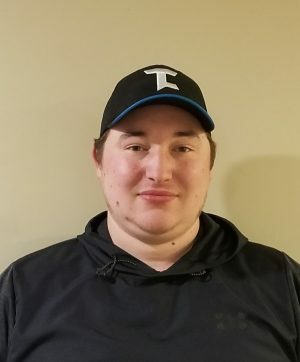 Agriculture has always been a large piece of my life, allowing me to become involved in organizations like 4-H. Once I am done my university career I hope to move back down south and begin working in the agricultural industry while also becoming more involved in the family farm. Chayce – well written piece. I enjoyed it. Pleased to see more and more of Stuart’s students stepping up to share these insights.